The angle between the axes of two polarizing filters is $45.0^\circ$. By how much does the second filter reduce the intensity of the light coming through the first? This is College Physics Answers with Shaun Dychko. 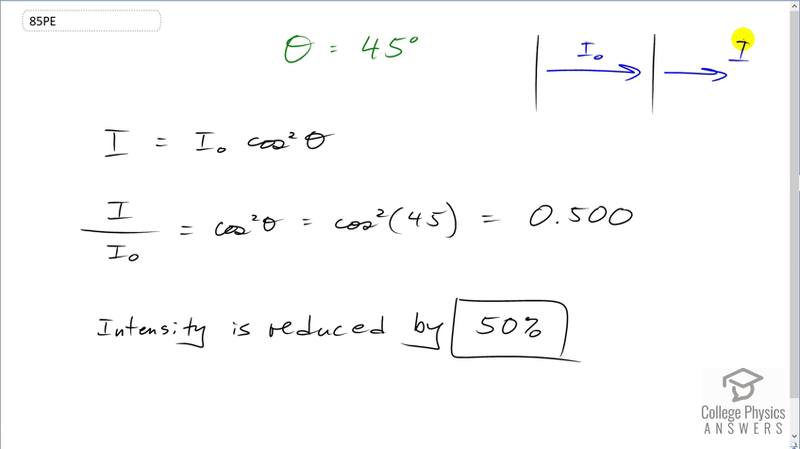 Two polarizers have their polarization axes different by 45 degrees and the question is by how much does the second polarizer reduce the intensity compared to the intensity that is transmitted by the first polarizer. So, we have an intensity <i>I</i> subscript ‘o’ so that’s <i>I naught</i> incident on the second polarizer which then transmits some intensity <i>I</i>. So, what's the ratio between <i>I</i> and <i>I naught</i> is the question here. So, we have an expression for this, it's the intensity transmitted equals the initial intensity times cosine of the angle between the polarization axes squared and so we can divide both sides by <i>I naught</i> and so we have the ratio then is cosine of the angle squared. So, that’s cosine of 45 squared which is 0.5. So, intensity is reduced by 50%.